POKHARA, July 3: Tourism entrepreneurs of Pokhara have urged Nepal Tourism Board (NTB) to increase budget for its Pokhara-based office for the next fiscal year so as to make its marketing and promotional activities effective. They also said that the budget allocated for the office for the current fiscal year was inadequate. Speaking at an interaction organized by NTB to collect suggestions from local tourism entrepreneurs for Fiscal Year 2018/19, most of the speakers called for more budget for marketing and promotion activities. Of its total budget of Rs 1.12 billion for FY2017/18, NTB had allocated Rs 59 million for its Pokhara office -- Rs 34.6 million for regular expenses and Rs 24.4 million was for capital spending. “The office has already spent around 90 percent of the budget,” Surya Thapaliya, chief of NTB’s Pokhara Office, said at the program. He added that the Pokhara office was likely to get Rs 70 million in the coming fiscal year. However, local entrepreneurs said that promotional activities of the lake city have been affected due to lack of budget. “Our marketing activities have been affected in the current fiscal year due to low budget allocation,” Bikal Tulachan, president of Paschimanchal Hotel Association Pokhara, said. He added that NTB did not provide budget to them for promotional activities aimed at domestic tourists. Tulachan also said NTB was not giving much priority to the Indian market. “If we do not prioritize, the target of welcoming 2 million tourists by 2020 cannot be achieved,” he added. 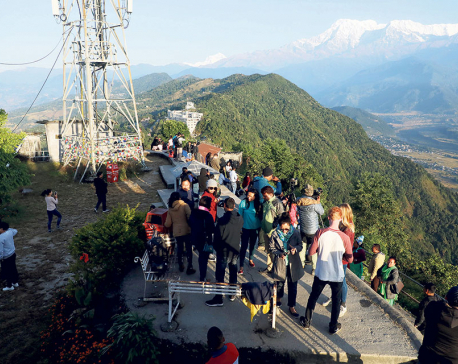 Another tourism entrepreneur Govinda Raj Pahari suggested to the NTB to focus on Chinese and Indian markets to bring more tourists to the country. “Pokhara is the second largest tourist destination in the country after Kathmandu. However, the city has not been able to exploit its tourism potential to the fullest due to low budget allocation,” he added. Also speaking at the program, Hari Ram Adhikari, general secretary of Nepal Association of Tour and Travel Agents (NATTA) Gandaki Chapter, requested authorities to allocate budget on time so that stakeholders can plan marketing and promotional activities accordingly. Kedar Sharma, president of Pokhara Tourism Council, urged the NTB to allocate at least Rs 100 million to Pokhara. “NTB has to spend at least Rs 100 million for its Pokhara office so that it can implement its promotional and marketing activities aggressively,” he added.